Eliza Apartments penthouse in Sydney have been released and they will certainly make you wish you had a spare $15 million in the bank. Ceerose until it had been styled, furnished and photographed and is only available for inspection through appointment. 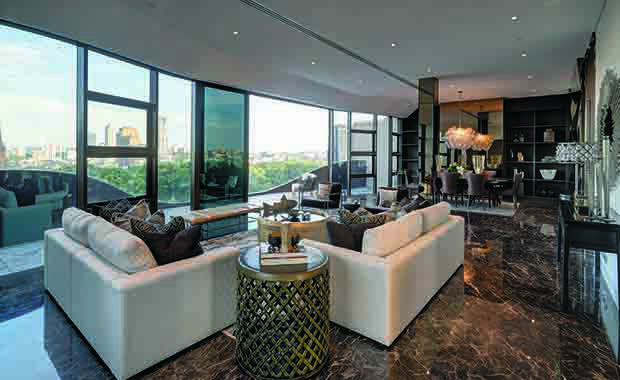 The buyers of the apartment are expected to be international jet-setters, expats and affluent locals, much like the targeted audience for the apartments under the penthouse in the Eliza Building. “Several of our full-floor apartments were bought by people from overseas who know that Eliza offers a rare chance to live in one of the best neighbourhoods in one of the world’s great cities,” said Ceerose founder Edward Doueihi. “These purchasers are tending to use their apartment as they would a luxury hotel, staying here when on business trips and when on vacation. While the penthouse has many glorious features, Mr Doueihi says that he thinks the rooftop pool is the best of them all. The infinity pool, which is located on the rooftop labelled an ‘entertainer’s haven’, is transparent, allowing swimmers to take in the views even whilst underwater. The penthouse kitchen is suitable for a professional chef, with a walk in pantry, separate preparation area, walk-in pantry and appliances that are the best money can buy (including a $50,000 fridge. )The ceilings are 50 per cent than conventional Sydney apartments at 3.8 metres high and the walls are expansive, allowing room to accommodate major works of art. The Eliza building and penthouse, next to ‘Sheraton on the Park’, overlooks Hyde Park in Sydney, allowing gorgeous views of both the city and the greenery of the park.